Stoke-on-Trent regional daily the Sentinel has unveiled its new-look website, which has been upgraded as part of an overhaul of the thisis… network. The new homepage has been designed to complement the mobile-friendly version of the site which launched in January. 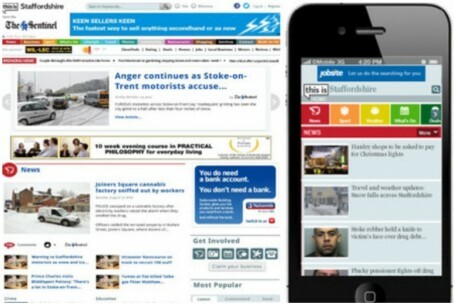 It features the Sentinel’s logo displayed more prominently, and the homepage has been split into news, sport, and events sections, with a ‘most read’ column down the right hand side. The move came after parent company Northcliffe – which has now been bought out by new publishing company Local World – rolled out mobile-friendly versions of all its thisis sites with the number of people visiting its pages from their phones predicted to soar in the coming months. A revamped version of thisisplymouth.co.uk, featuring similar changes, has also been launched while the new thisissouthdevon.co.uk site will launch on 26 March. The new sites have been developed as part of an overall revamp of the thisis brand. The company has now rolled out HTML5-friendly mobile websites for the whole network, improving the speed and ease with which visitors can navigate the sites. A total of 31pc of all visitors to thisis… sites in November did so from a mobile handset, including 2.4m unique visitors. The thisis network will be transferred to new publishing company Local World as part of Northcliffe Media’s merger with the Iliffe newspaper group.